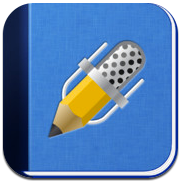 Notability - All about apps in YOUR classroom! There are a lot of note-taking apps in the Apps Store. My favorite as a classroom teacher is Notability. When I combine it with my Keynote Presentations and Apple TV, I find it is a great way to do my presentation with out being tethered to the front of the room. Once I have my presentation in Notability, I can just scroll through my presentation. I can also draw and highlight my presentation as I walk around the room, or put the iPad down and have a student annotate a map. At the end of class, my presentation cleans up in Notability with ease so that the presentation is ready for my next class. If you are looking for a full functioned note taking App that works great in a classroom, Notability is a value for 99 cents.